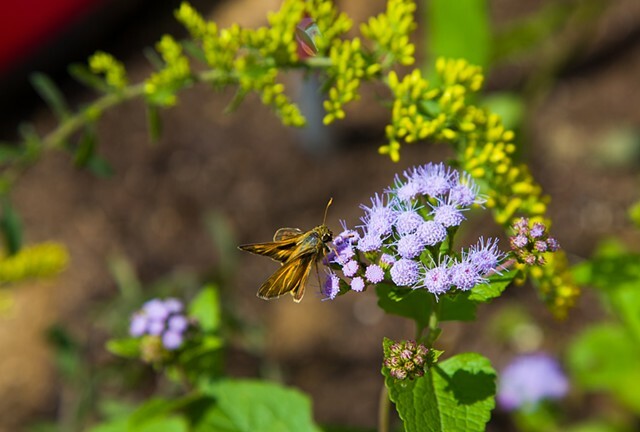 A Fiery Skipper butterfly (Hylephila phyleus) stops to drink some nectar from one of Field of Vision's planters, filled with Mistflower (Eupatorium coelestinum) and Gray Goldenrod (Solidago nemoralis). The river serves as a butterfly highway or sorts—one reason for my siting the project there. Many butterflies, such as extremely beautiful Monarchs, Tiger Swallowtails and Spicebush Swallowtails are constantly passing through the area.